Winona making the poster is nothing less than a crime! 200 years on from the events of Alien 3 – and the death of Ellen Ripley… and she’s back, cloned from DNA retrieved prior to her death aboard a massive spaceship. Why it had to be Ripley and not some random? Who knows aside from the obvious cinematic reasoning, but after a few tries #8 comes good and supplies the diabolical scientists with what they are seeking – a Queen alien. Now if a clone 200+ years into the future knows what lies ahead (maybe she has seen the first 3 films?) we shouldn’t be too surprised that she is right. The scientists eventually decide to keep Ripley #8 alive and she exhibits miraculous healing powers and almost superhuman tendencies – the fact that they use basketball to highlight some of these new abilities lead to a scene best described as uncomfortably corny. Once the aliens put their heads together and come up with an embarrassingly easy escape the usual modus operandi begins, only this time more than a dozen aliens are criss-crossing the ship in search of tucker. In the early stages everyone able to escape does just that, for the rest it is every man, woman, android or cloned-alien/human hybrid for themselves. "Ripley, I said no tongue!" There is a cool underwater sequence that looks particularly cool (and as usual in film everyone can hold their breath for around 4 minutes). The Queen seems a lot bigger this time out but gets minimal time onscreen and even less to do when she finally arrives and a finale that leaves me on the fence, it is either plausible or lazy – I can’t decide. 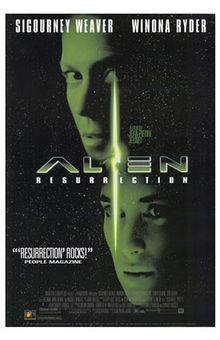 Aside from dredging out the same basic formula of Ripley + stragglers once again the main problem is that Alien: Resurrection is spectacularly miscast. The ship’s commander is Dan Hedaya and he’s just wrong – but believe it or not he isn’t the least appropriate – that would be Winona Ryder as Call, a member of a group of less than honourable space cowboys. The team are allegedly tough, rough and dangerous to know, and with Ron Perlman and the excellently gruff Michael Wincott among their number some of them are – but Winona and a physically challenged and over-acting guy named Vriess it’s more of an impractical eyebrow raising joke of a crew in reality. Some of Winona’s dialogue sounds plain bizarre when she says it. Team that with a cartoonishly over the top Brad Dourif as a cuckoo scientist and you have a higher ratio of perplexing decisions than you have realistic characters, never a good thing. Final Rating – 7 / 10. (But read the paragraph above) Alien 4: Resurrection is far and away the least of the series, but it has a couple of decent moments. 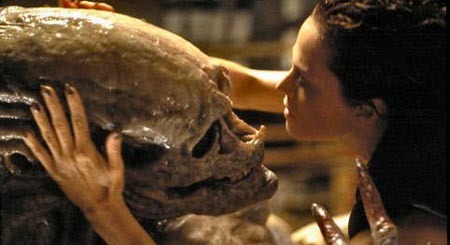 Ripley – even a cloned hybrid Ripley – deserved better.